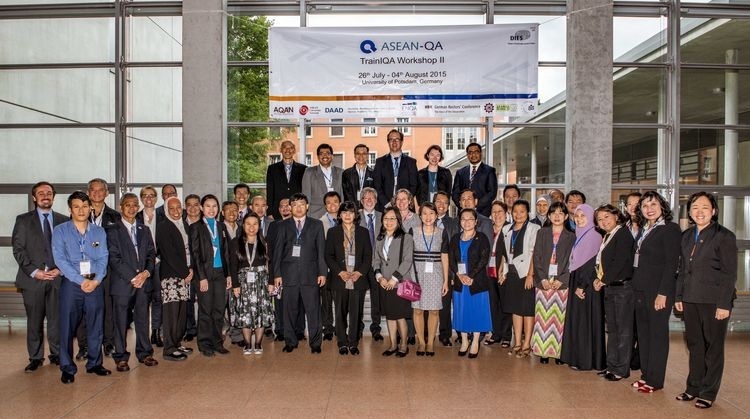 The second ASEAN-QA TrainIQA workshop took place from 27th of July to 4th of August 2015 in Potsdam, Germany. The main topics of the workshop were tools and procedures for quality assurance in higher education institutions, with a focus on the different process steps of an evaluation, survey design and data collection methods. As well as during the previous workshop in Kuala Lumpur, the 32 participants had ample time to work and discuss on their institutional project action plans. Through the implementation of these projects, systematic internal quality assurance structures are meant to be established at the participating higher education institutions. During the workshop, the participants also used the chance to network and to exchange own ideas and best practices to learn from each other´s' experiences. The participants also had the chance to visit the Centre for Quality Enhancement of the Technical University of Applied Sciences Wildau. The colleagues from Wildau introduced the quality system of their institution and gave a tour of the campus. A documentation of the second workshop can be accessed here. The next TrainIQA workshop will take place in Bali, Indonesia, between the 9th and the 13th of November 2015.